Most software’s have been developed by us according to this plan. As per clients requirements we developed manual board creation as well as automatic board creation. This plan provides different logic to its clients for board split. Client can choose single board system, double board system or multiple board system. Once after the initiation of MLM Board Plan every member has to sponsor the people in 3:3 ratios. An outstanding amount of payments and encouragements can be made on the number of joining made by the main board plan member. Substantial prospects can be made manageable through joining into the Board Plan MLM development. M4 MLM Software has developed 2 board system one board system, 4 board systems, and 3 level board systems as per the clients’ requirement. We provide multiple varieties of board split logics as per client chosen logic to meet their 100% requirements. 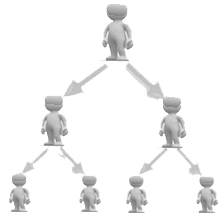 Leading MLM prospects are being offered to clients in the MLM board plan. Board plan compensation is the new plan and gaining more appreciation from more MLM clients. The company MLM Board Plan experts are professional and capable in understanding the client requirements regarding the building and modification of the existing board plan according to the MLM industry.